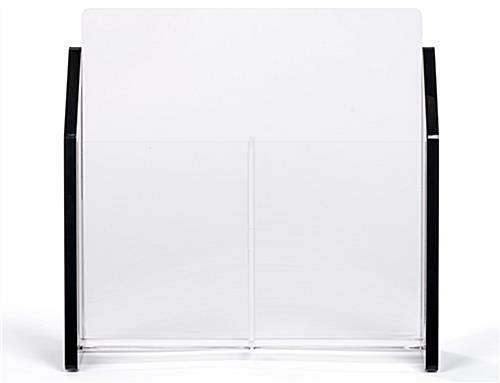 Front acrylic panel is clear to allow customers to view the literature. Black end caps create a contemporary yet professional appearance. Long-lasting design will withstand everyday wear-and-tear. 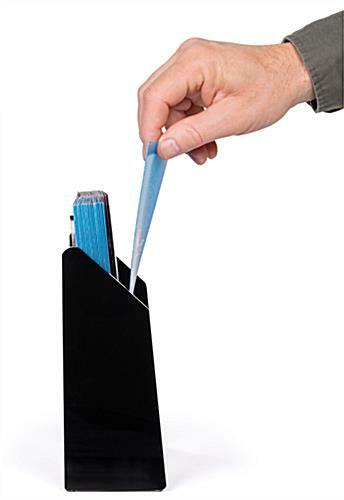 This 2-pocket literature holder is a practical brochure pocket for any countertop P.O.P. setting. 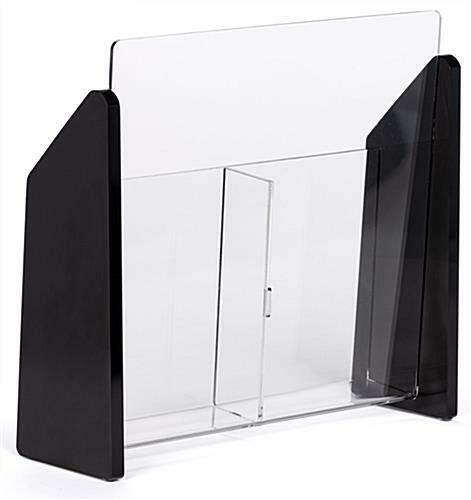 Banks often use this acrylic leaflet stand to offer loan applications or rate information to their customers. 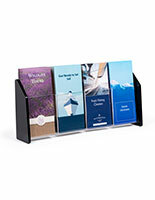 Other common uses for this brochure display, literature holder are; on a desk at a travel agency, on a hotel concierge desk, within an informational booth at a tourist rest station or even in a museum or gallery. 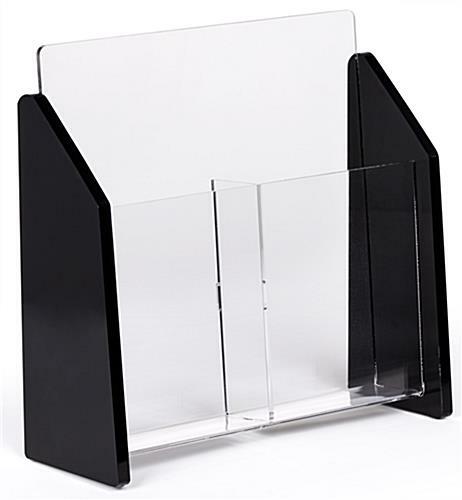 This literature holder, such as a leaflet display, is made of a clear acrylic. This clear front panel enables curious viewers to see the entire cover of each flyer on display. 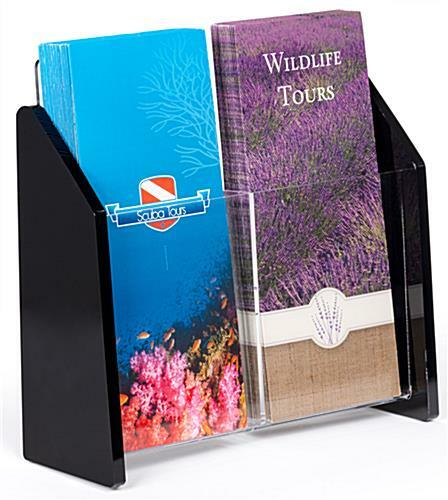 Each brochure holder, literature holder has 3/8" thick gloss black acrylic end caps for a sleek and contemporary look. 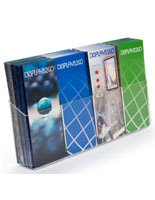 This leaflet rack features a permanent separator that keeps the contents neat and organized. 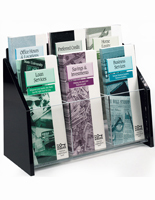 With its rubber, non-slip footings, this brochure display is a great literature holder to add to any countertop area. The rubber pads also help to minimize wear and tear on delicate wood desktops or counters. Each literature holder features two pockets that are 1-1/2" deep; allowing for a large number of standard flyers. This large capacity will require less frequent refills, allowing employees to attend to more important tasks. 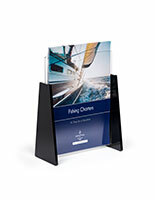 With great graphics on your pamphlets, the literature holder, also known as a brochure holder, will draw your customers in and make them want to learn more about what you are promoting. 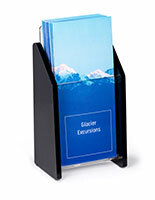 Buy this leaflet dispenser in bulk for even greater discounts. There are several other literature holder options offered within this same series including; one, three, six, ten and twelve pocket configurations! 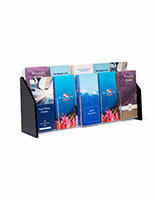 9.1" x 8.5" x 3.3"
We opened a new office and wanted something nice looking to hold our brochures. These holders are nice quality and look great. We ended up ordering more for all of our other branches. We're so happy to hear that you're quite satisfied with your brochure holders, Carol! Thank you so much for your purchase!